For 20 years, Abalone has attracted millions of players. Now, OffBoard revisits that old favourite! Fresh game mechanics, fewer marbles, an original starting set-up and considerable freedom of movement are the heart of the game. 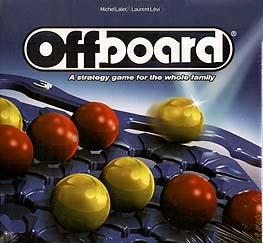 Your objective: score 6 points by pushing your opponent's marbles onto the targets on the edge of the board.